Home Parker Community Technologies Electromechanical Group Electromechanical Knowledge Base How do I clone an AC10? There are a number of different ways in which the Clone Module can be used with AC10 drive. It can be used to Clone a drive or it can be used as a USB to serial converter to allow a pc to communicate with an AC10 via the Modbus A and B terminals and the software PDB V1.3. F900 = Inverter Address, range 1 - 255. Recommended setting is 1. F904 = Baud Rate = 9600, Set to 3. F905 Timeout period 0 - 3000 seconds. If the inverter has not received a communication from the PC the duration of the time set, the A10 will trip on CE. Setting F905 to 0.0 seconds will disable the timeout alarm. In PDB click on the protocol Icon . The settings must match those in the drive. Set the timeout window to 50 ms to speed up communications. 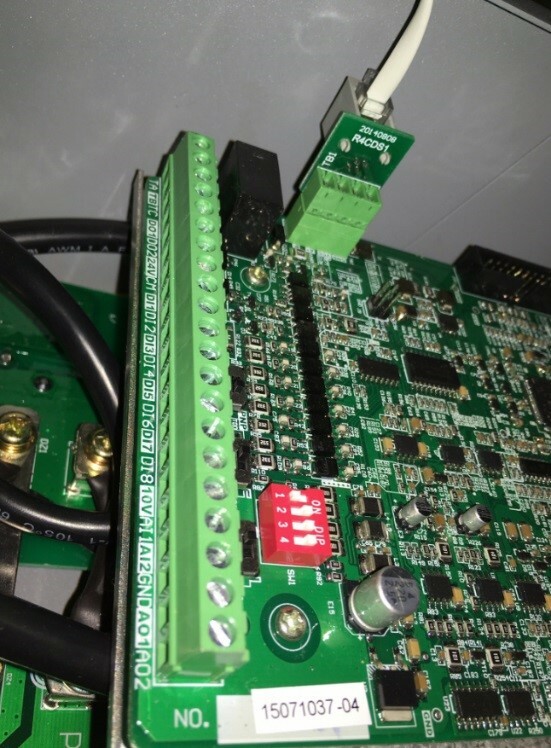 To use this feature the drive firmware must be version 2.07 or greater, for a 22kw drive or smaller. Parameter F105 is the firmware version. Verify the firmware version of the drive. 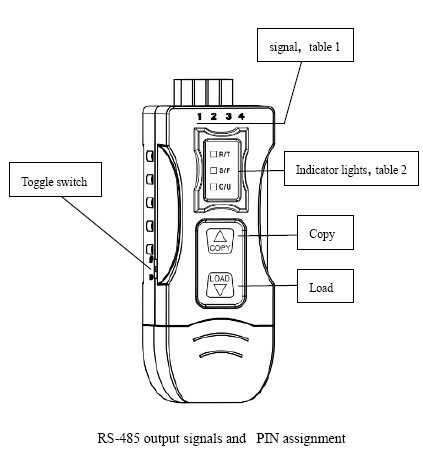 C/U Mode selection of parameter copying Cloning Tool or USB/485 converter. 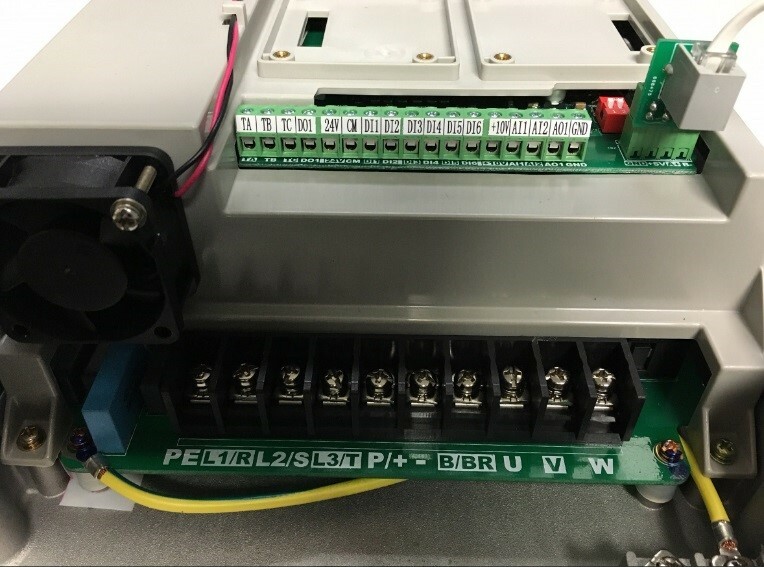 For an AC10 IP20 Drive over 30 kw connect it as Shown. 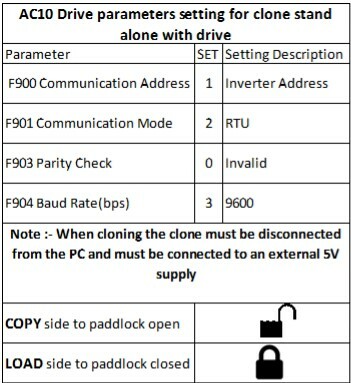 For an AC10 IP66 Drive connect it as Shown. 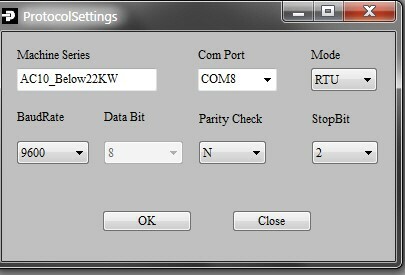 The communication parameters in the drive must be set to the default parameters. Slide the toggle switch into the Padlock open position located on the side of the module. Press & hold the COPY button until the drive MMI display will show COPY. This may take 5 seconds. The C/U LED on the Clone tool will turn Red on then off. When the parameters have been downloaded successfully, the S/F LED will be Green. To copy Motor Parameters set F640 = 0. By default F640 = 1. Motor data is NOT copied. See Note 1 at the end of this document. Set the toggle switch to the Padlock closed position. Press the LOAD button. The drives display will show LOAD. This could take up to 10 seconds. The C/U LED on the clone tool will turn Red on then go off. Parameters stored in the Clone Module can be uploaded into PDB and parameters stored in PDB can be downloaded in the clone module. Plug the Cloning tool into a USB port on your PC. It must NOT be connected to a drive. Check the COM port number in Device Manger. The Protocol settings in PDB must be set as shown below. Also the Timeout function must be set to 500ms. 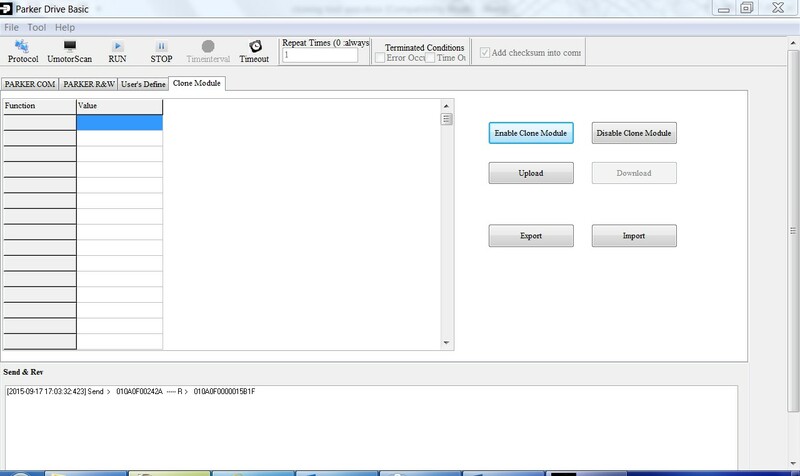 Click on the Clone Module tab and then the Enable Clone Module button. Upload: Uploads drive parameters stored in the clone module into PDB. Export: Saves Uploaded data as an ".xls" file. Download: Downloads drive parameters open in PDB into the clone tool. Import: Loads an ".xls" file into PDB. Disable Clone: Disables the Clone Module. 1 S/F LED is always on No valid data in Clone module or it is wrong. 2 S/F LED is on once in 2 seconds Data is received wrong. 3 S/F LED is on twice in 2 seconds Receiving wrong code. PC is forbidden from copying. 4 S/F LED is on 3 times in 2 seconds Slave computer is interrupted while copying.